Flap copy: It's that wonderful time of year, when once more cows have come back to the family home to be together around the Christmas tree. But while dancing the Cowpoke Polka, Moosha CRASHES through the floor! The whole family tries to pull her out - Pa even brings out the tractor - but Moosha stays stuck, right in the only place the tree can go. Will Christmas even come this year? 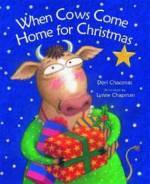 But then these clever cows come up with a way to save Christmas and begin a fine cow tradition. Dori Chaconas's funny rhyming story and Lynne Chapman's hilarious illustrations combine to make a happy present for the entire family. Behind the scenes: There are three (quite lovely) cow characters in the book, and I had the pleasure and the fun of naming them after three (quite lovely) writer friends - Lisa Wheeler stars as LooWeesa, Marsha Hayles excels in the role of Moosha, and Linda Sue Park gives a delightful performance as Lindy Soo. (I hope none of them are offended about having to wear those cow hides.) Please visit their websites! Three amiable bovine sisters always hoof it back to the ranch each year for the holidays, only this year they have a little problem. One sister, Moosha from New York, was having such a good time dancing the Cowpoke Polka that she crashed through the floor with both back legs, right up to the hem of her bright pink dress. Moosha is stuck in the corner where the Christmas tree was to be set up, and the relatives couldn't free her, even with Pa's tractor. But these cows, like all farm folk, are an inventive bunch, so they decide to decorate Moosha as the Christmas tree, starting a new family tradition. The rollicking, rhyming text is full of fun and drama, but it's Chapman's illustrations that make the cows come to life with humorous expressions and outfits. Her cows all have their own personalities, right down to little cousin Dale, who hangs a golden star on Moosha's tail and solves the family's dilemma. There's no place like home for the holidays, in Chaconas's (Christmas Mouseling , reviewed above) humorous tale, especially when home is a tiny abode crammed to the rafters with favorite relatives. Such is the merry mayhem for a boisterous bovine clan who gathers to sing, do the Cowpoke Polka and decorate. But when happy hoofer Moosha's hooves crash through the floor, she's rooted in the spot meant for the Christmas tree. Kids can guess what happens next - as Aunt Moosha launches a new family tradition. Bold pastels of dapper, dancing cows add celebratory zing. Ages 5-8. Copyright © 1997-2005 Reed Business Information, a division of Reed Elsevier Inc. All rights reserved. Anyone who wants to learn how to write rhyming picture books the right way needs to study Dori Chaconas's collected works, and this newest addition is no exception. Man, it's funny, the rhyme impeccable, and the illustrations perfectly suited to this kid-friendly tale of a Christmas family reunion nearly ruined when one of the gathered family crashes through the floor where the tree is supposed to go, threatening the whole coming of Christmas! Holy cow! (Sorry, couldn't help it. <g>) But not to worry, poor auntie Moosha, stuck in the place of the tree, will just have to do, starting a whole new family tradition. Copyright © 2002-2005 Smart Writers.com. All rights reserved.